It is spring and that means warmer weather, flowers blooming, and more time outside! Spring is many people’s favorite times of the years, but with the warm temperatures and damp weather often invites annoying pests into your home. Ants are the most common invaders, perhaps numbering as many as 1,000,000,000,000,000. They are attracted to food inside your home, in bags, even in your car and can very quickly make a marching trail of thousands into your home. They live anywhere in and around your home or business — and often nest in your lawn, walls, stumps and even underneath your foundation. When they become too much to manage, contact Eco Tech of Minnesota. 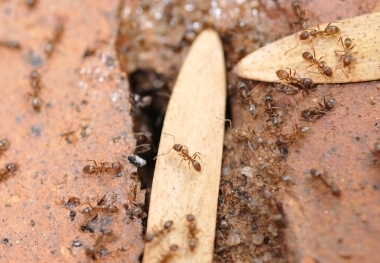 Our team has served the entire Twin Cities area for more than 15 years with effective ant extermination and can help you get rid of ants this spring once and for all. We all know that ants are attracted to sweet or greasy food, or water, so keeping food enclosed, cleaning up messes can help remedy a minor ant problem. However, when these measures do not work it is likely that the ant problem has reached a point where extermination is necessary. The Eco Tech technicians will locate the source of the problem – the ant nests so that the problem can actually be eliminated and prevented from returning. Our crew will also determine the species of ants and develop a plan for thorough treatment that will be effective for the ant species present. With more than 15 years of experience in pest control, our crew are experts in locating nests and eradicating entire ant colonies. Eco Tech is a Minnesota natural pest control service, using all-natural solutions for insect control that work effectively in residences as well as commercial locations. This means that our pest control solutions are safer for your children and pets and it also means that the environment and the other animals that prey on the insects being targeted will not be harmed. Our customer service team provide you with an affordable quote for getting rid of the ants in and around your property without hidden charges or pressure for a contract. We are a local company that understands that you do not want to pay for unnecessary treatments. Call our team today at 1-763-785-1414 to schedule a time for our team to get started.